Follow the package directions to make your batter. Then divide it up into 6 bowls (because I used 6 colors, but you can adjust based on your design) and add the food coloring. Use the gel coloring you get at craft stores. The liquid stuff won’t give you the vibrant colors. Layer the batter in the pans any old which way. Mix it up and have fun! Then bake it per box directions, ice it (I used homemade buttercream icing) and dig it! 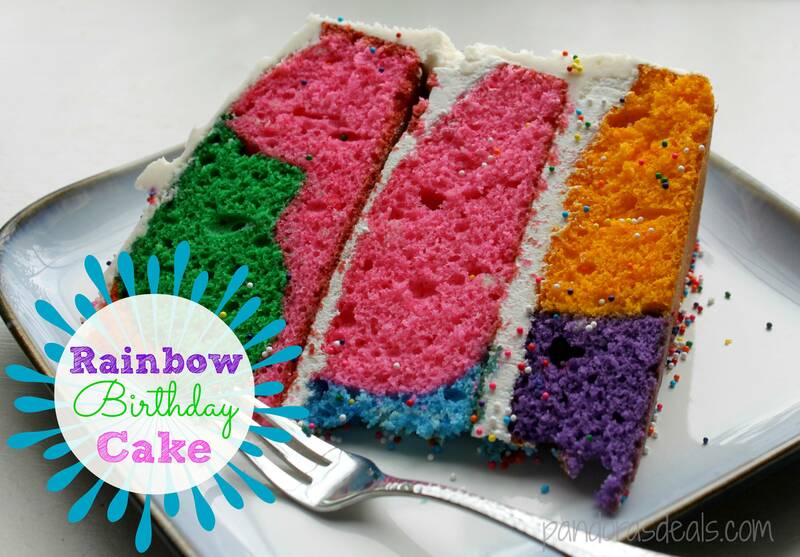 Rainbow Birthday Cake is perfect for any celebration! Who can’t get excited about a cake this pretty? Cake: Preheat oven as directed on cake mix box. Grease and flour, or use baking spray, three 9" round cake pans. Prepare cake mixes as directed on the box. Divide the batter evenly into 6 bowls. A tip to make it easy: Use a 1 cup measuring cup and scoop 1 cup of batter into each bowl, then divide the rest of the batter into each of the 6 bowls just by eyeballing it. It doesn't have to be exact but this is an easy way to get it close. 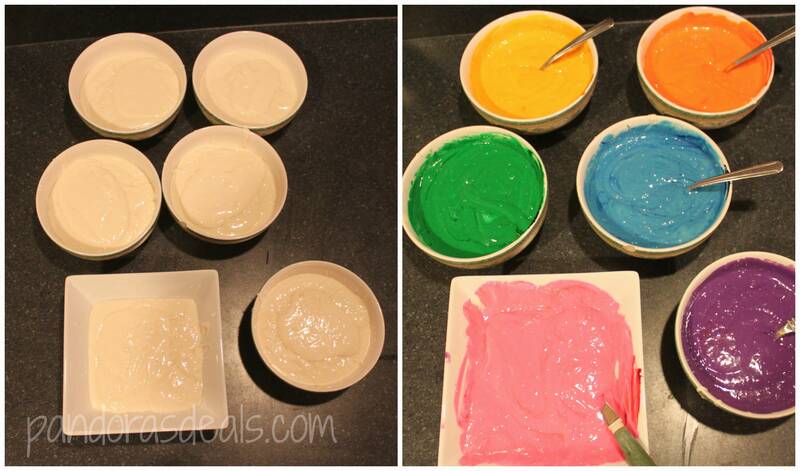 Use 1/2 teaspoon of gel food coloring to color the batter in each of the 6 bowls. You do not need to measure this out. Just eyeball it by getting a small hunk on food coloring on the end of a knife and mixing it in. A little goes a long way. I used pink, orange, yellow, green, blue, and purple. 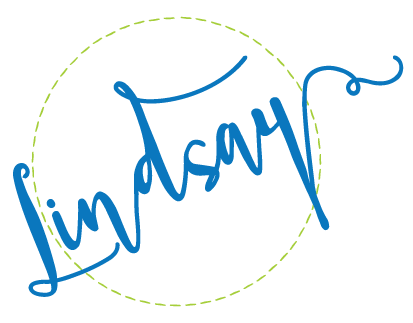 Feel free to come up with your own color patterns to mix it up. 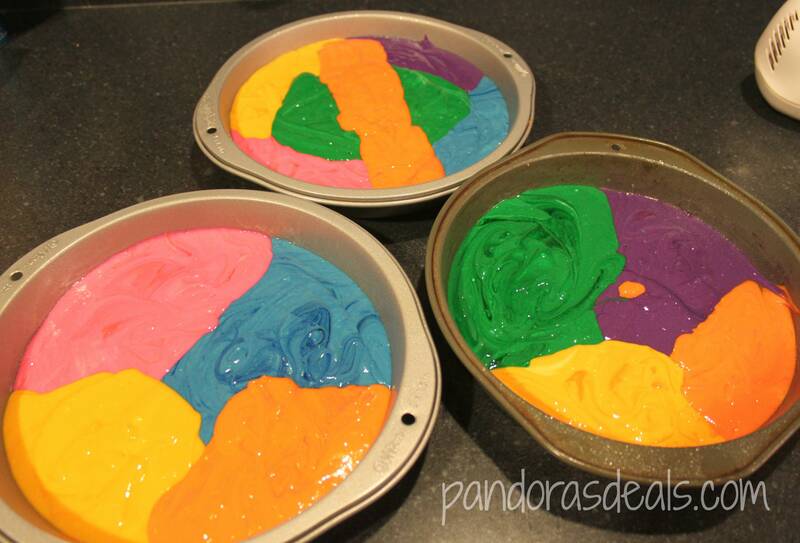 Fill the cake pans with batter by layering the colors randomly. Try to get the batter divided evenly among the 3 pans. If it's not perfect, that's okay. Bake all three cakes in the oven as directed on the cake mix box. If you haven't poured them exactly evenly, keep watch because they might finish cooking at different times. I pulled all three of my layers out at different times because they weren't exactly even. Allow the cakes to cool on a wire rack. Icing: Beat the butter with a mixer until slightly fluffy, maybe 20 seconds. Add the confectioner's sugar about 2 cups at at time, alternating with a tablespoon of milk until you get the consistency you want. Don't make it too runny or it will drip off the cake. If it's too stiff, add more milk. Too runny, add more sugar. Mix until smooth. If your layers are at all uneven, put the smallest, flattest layer on the bottom. Ice the top. Add the second layer and ice the top. This should be the next biggest layer if your layers are uneven. Add the third layer and ice the sides of the entire cake. Then ice the top. Decorate as desired. Rainbow sprinkles are fun! 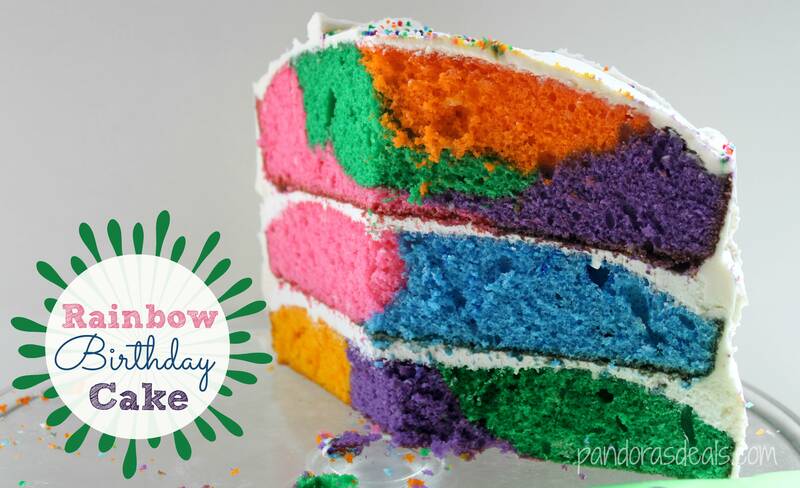 Gently pull the pieces of wax paper out and you'll be left with a clean cake plate! What a fun cake! I love it! Thank you! My daughter thought it was awesome for her birthday!